Step two in Randy’s (Barrister’s Block) Bullseye sew-a-long. I have never done raw edge applique before and I am enjoying the challenge. A while ago I got an e-mail from a fantastic garment designer in Portland, Maine, Jill McGowan. She said she had bags of scraps from her clothing line and wanted them to know if our quilt group could use them. Not being one to decline any fabric (free or not) I went down to the city. When I walked through the door there were mountains of scraps in large clear plastic bags. Which ones do you want me to take, I asked? ALL of them she said – whoa! I filled (and I mean so full that I was afraid of being stopped for obstruction of visibility) my Jetta wagon to the brim. I passed them out at our next meeting. Well. My friend Christina is making a dent in her bag. Here is a little Lucy Boston block she made with some of the fabrics. Hopefully there will be more to show in the future. Thanks Jill and Tina! This is a long post, but it is a quick read. Beginning tomorrow I am starting another sew-a-long (what did I say yesterday????). 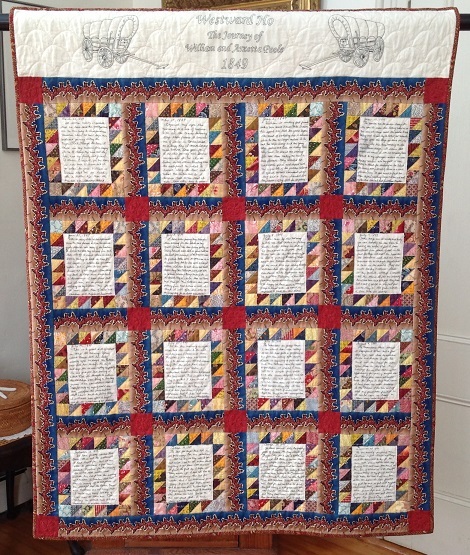 Barbara Brackman (Civil War Quilts) is hosting a new block of the month, "Westering Women". Do read her post if you are at all interested in the history of our westward movement. 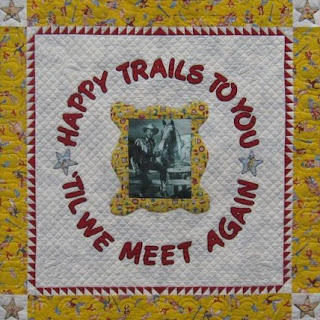 I too believe there was little quilting done while traveling west. When would they have the time? I know I can manage one block a month and this one is near and dear to my heart. Come on and join the fun. I know we all had fun with the Time Warp Stars (my finished quilt WILL be posted someday. I inked the heading and the diary pages. My wagon wheels look as if they have traveled over a lot of ruts! and here is the story I wrote if you are so inclined. Do get a cup of tea or better yet a glass of wine! 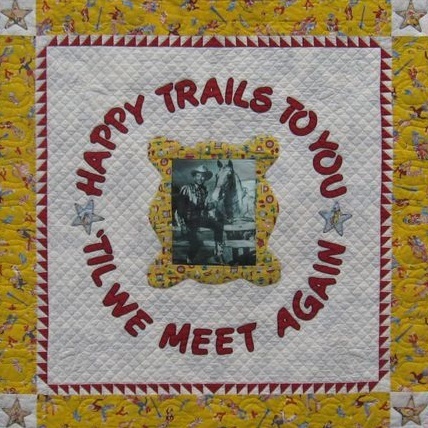 It seems nearly impossible that we have said our goodbyes and are on our way to Independence, Missouri where we will begin our westward journey along the Oregon Trail. Through the tears I could see my mother’s face longing for me to change my mind and stay here, near my family and friends. Of course, I cannot, for my home is now with William and I go where he goes. William is certain we are heading for a better life than the one we are leaving behind. I opened my eyes this morning to a sea of wagons. With all the canvas billowing atop their frames it reminds me of the sails in Boston Harbor on a busy day. I cannot let my mind wander home again, for if I do this journey will become unbearable for me. As we listen to the stories traveling down the waterfront on what to expect along the trail, and what our daily duties will be, it becomes clear to me that I will have little time to pine. William is making fast friends with a man named Simeon Porter. Simeon has spent the last two years before the mast of a whaling ship, a situation which he can no longer endure. So, he and his wife Mary and two young boys, Joshua and Evan are making their way west. We shared our evening fire with them making our meal a true pleasure. Mary collected her needlework purse and shared with me a few bits of her precious calicoes. I opened mother’s abundant scrap bag and in turn handed her tiny remnants of my past to add to her piecing. The weather was too severe today for the oxen to move the heavy wagons so we are at camp until the weather breaks. Mary and I will try to take a few moments together after the boys are down for the evening. She has been working on the most clever design. It seems that pieces so small, I would have normally tossed to my younger sisters, are now being worked into my quilt. I have Mary to thank for showing me her talent for using up every scrid of calico in a most pleasing way. We have both vowed to finish our tops before reaching Oregon and that we will meet after our arrival and quilt them together. With so many older, yet less experienced men on this journey, William has become quite popular with many of the families. He helps me with my evening fire and then sets off to assist others in need, barely making it back in time for his supper. I admire his generous nature, but I fear he will wear himself out if not careful. I am doing my best to keep him comfortable in the evenings. I have found that not all men are as patient and obliging as my William. My job is so much easier than of those with children and difficult husbands. I have been piecing tiny triangles this evening for the blocks in my quilt. Joshua has been feeling poorly so Mary has not been able to piece with me the last few evenings. I do hope he will feel better soon, she worries so. He is a small boy, but he has such a cheerful nature, I’m sure he will be up and about before long. Mrs. Patterson has offered to aid in Joshua’s recovery. Being a midwife, she is the closest thing to a doctor that we have met thus far. Mrs. Patterson does some piecing from time to time as well. I think I will offer her some of my scrap bag for her kind assistance. Evan came by this morning to tell us that Joshua is feeling much better today. He said if he continues to improve that Mary will be by this evening for a bit of piecing. Breaking camp was a bit tedious this morning, as the wind has come up strong already. William has gone off to render assistance to the Applegates and Mr. & Mrs. Patterson. I’m sure these families appreciate William’s help. I’m happy to have such a wonderful group to travel with. It would be impossible to make this trip alone. Some days are so windy and dusty you can hardly see the oxen in front of the wagon. I feel I have swallowed five pounds of dust in the past few days. It must be hard for the animals as well, but our team marches on as though they hadn’t a care in the world. They are such hardy creatures. Amos is my favorite, although I wouldn’t tell the others! All four are extremely hard workers and although they have lost a bit of weight in the past few weeks, they are still quite robust. I love them all dearly. There is a great deal of sadness in camp this morning. Young Laura Brown lost her baby shortly after midnight. Mrs. Patterson was with her through the night and says she is now resting comfortably. In my prayers last evening I asked God for strength to endure the hardships I am facing on this long journey. I am now ashamed that I thought only of myself and I can only imagine the pain and loss that Laura must be feeling today. I will make every effort to comfort her for the remainder of our journey. The air this morning is crystal clear and the view to the west is like none I have ever seen. Mountains rise above the earth as if to beckon you toward heaven itself. For the first time since our departure from Boston, I understand William’s desire to experience this new world. There is still a long way to go, but I have found a new outlook on our journey. William has seen the change in me and in his face I see a joyous expression that I have not seen since we left. This is truly a beautiful day. The mountains are getting closer. I can almost hear them calling to us. We had quite a gathering at our fire this evening after supper. Laura is beginning to piece with us, and Mrs. Patterson came by with a few other ladies. I started Laura out on a simple 4-patch and she seems delighted with her efforts. I’m not sure what I would have done if I had not had mother’s scrap bag. It has helped me make friends and has kept me busy in the evening when my mind likes to wander homeward. The mountains which seemed so magnificent to me but a few days ago now bear treacherous trails and arduous climbs. We must rest the team far more often than on the flat. The evenings are so cold there is no opportunity for piecing around the fire. Mary goes down at night now with the boys to keep them warm. I have given our extra bedding to the Brown’s. I am now wishing that my quilt were finished as it would come in handy on these cold nights. We have finally reached Fort Boise. It is not the settlement I had hoped for, but we are able to purchase a few much needed supplies for the nearly 400 miles that remain ahead. William has heard talk this morning of a number of families that will now be veering off to California. I am thankful that the Porter’s, Patterson’s and Brown’s are not among them. I would miss Mary terribly if they were to leave now. God willing, we should make it to our destination in another month. The last few days have left us all quite weary. Our one salvation is that we are so very near to our destination that we can endure almost anything to get there. I am anxious to finish the quilt top I began so many months ago. I have not had the time or the energy these last few weeks, but I am determined, as is Mary, to finish this before we set foot on our new soil. William keeps me in good spirits each night by describing the house we will build on our newfound land. I will have pleasant dreams tonight. We have made it! Like the pearly gates of heaven, the tiny steeples of Oregon City are a sight to behold. As we head into town I can see the great relief in William’s eyes. It has been a long arduous journey and we have survived it together. After resting the team, William made his way to the Government Claims Office. He chose his 640 acre tract with confidence. Within the week we will head for our new home. We spent this first evening in civilization with our new friends. It seems that Simeon and Mary have chosen a parcel less than two miles from ours. Life is good. We are merrily preparing our Christmas repast. Simeon and Mary and the boys will be by for the noon meal. I miss my mother and my family back east more than usual on this eve of celebration. I am thankful to have Mary as my friend and we will make our own traditions here in our new home. I have finished my quilt top and we put it in my frame last week. Mary has but a few more pieces left and I have promised to help her put hers in before New Year’s Day. I know that 1850 will be a wonderful year. 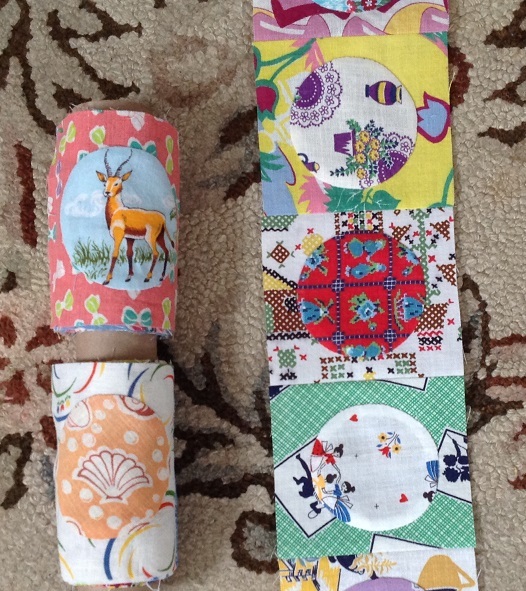 I’ve joined yet another sew-a-long. Randi at Barrister’s Block, has a great sew-a-long block that I thought would be perfect for one of our veteran’s quilts. Sew So, here is the first step. Simple right? Well, I just went back and re-read the instructions and it looks like the second step of adding the next layer of circles happens today. That makes me already behind. Hmmm??? Next time I see a sew-a-long that I like I will turn off the computer (well, maybe). My friend Karen is making a medallion quilt. What do you think about the center? Karen rescues Shih Tzu’s and currently has five. They are all adorable and very helpful in the quilt room. Karen and I took a class from Karen Dever (KarenDever.com) at the Maine State quilt show last summer. The surrounding blocks are Karen Dever’s, “Ault Star”. It is a block from an antique quilt she owns. Of course my blocks are still sitting in the box, but maybe I will put them into an orphan scrap quilt this winter. Here is what Karen’s quilt top looks like without fur. Isn't it beautiful! I thoroughly enjoyed the time I spent over the holidays simply hand stitching. My Quilty 365 circles kept me entertained each morning and I spent my evenings keeping up with my other “applique” obligations pleasures. 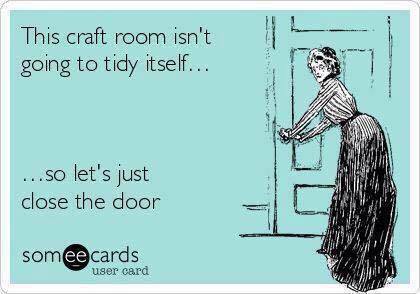 So, when I opened my sewing room door on Saturday, I could hardly believe the mess that stared back at me. I’m sure we all use our personal space as a catch all during the busy holiday months, but this was, well… see for yourself! I spent a little lot of time this weekend straightening. One half of the room done. The other half this coming weekend. I feel better for coming clean and showing the true me. I just hope I remember how to use my machine, once I uncover it! 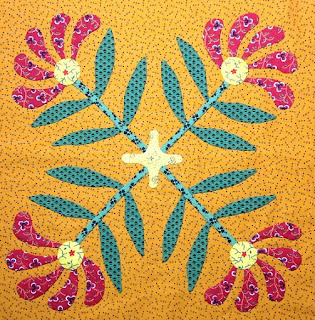 Finished my January block for the Shenandoah Valley Botanical Album Quilt (SVBAQ), Star in the East. I love this block. May do an entire quilt with this block “someday”. So, how many “someday” quilts do you have? Grace (City Mouse Quilter) counted just her UFO’s a while ago and came up with 41. I thought that was a lot, so I went to my “written” list of “someday” quilts and oddly enough, there were exactly 41. Of course only 33 of them were actually started! And, this list is by no means all encompassing. I will often start a new project that hasn’t even made it to the list. I suspect I am not alone here! 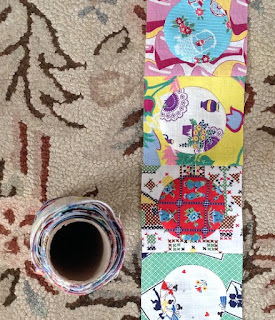 In the meantime, I am really enjoying my Quilty 365 circles every morning and my monthly SVBAQ block. 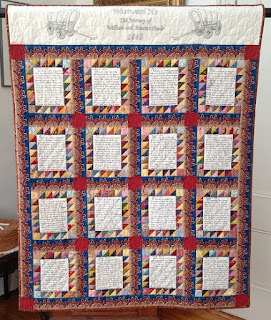 I am very tempted to start Barbara’s new block of the month on her Civil War Quilts blog. Somebody stop me! Thought I would share my “spatial relationships” with my “special relationships” (all my new friends in Blogland that is). This is my “work station” where I sit each morning before heading off to work or weekend frivolities. Since November 8, I have begun the day (thanks to Audrey at Quilty Folk) by appliquing a little feedsack circle onto a 4 ½” square. Then I move on to whatever is on the schedule for that day. 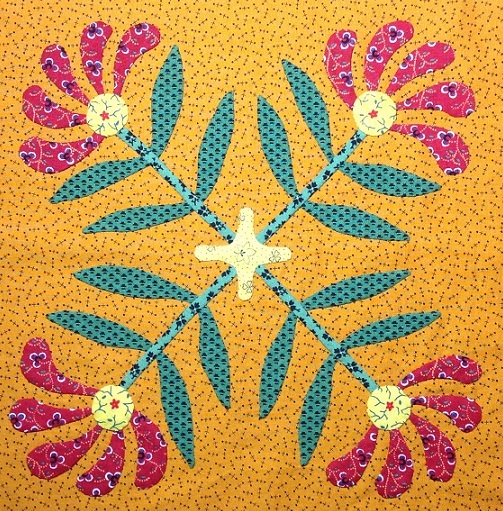 Today it is the next block (Stars in the East) in the Shenandoah Valley Botanical Album sew-a-long. Hope you enjoy your morning (and evening) stitching. 3) I was angry that our only grandchild was diagnosed with moderate to significant autism. So, how did I do with my 2015 “word”? 1) I found out early last summer that the company I had worked for for nearly 30 years was being sold. Somehow this news caused me to not only accept the fact that I liked my job, but it changed me into the thinking that I was truly thankful to be able to work in order to support my quilting habit. Hence, I was able to focus on my problem and chisel out a few more hours each week just for quilting. 2) My fantastic sister and her “saint” of a husband built a new garage over the course of the summer with a delightful “mother-in-law” apartment for my Mom. Her new attitude is working miracles on her mental and physical state. I am so very thankful! 3) Our grandson just turned 5. My son and his wife are fantastic parents. He is enrolled in a special school which he loves. We are blessed to be able to have him visit overnight one night every week. He has made fantastic strides to fit his square little pegs into our perfectly round world. It still pains me to see how hard he works sometimes just to make his point known. However, I have not only accepted his diagnosis, but I have embraced who he is and I am thankful every single day for this little man! So, I did alright by my 2015 word and by all rights should in fact choose “thankful” as my word for 2016. But, I feel that life is too complex for me to choose just one word. There are so many words that describe me and who I am and describe the goals I have set forth for myself. So this year I am going to write a personal “mission statement”. I won’t bore you with the details (too late for that one, I’m sure). But I will tell you that “creating” will be at the top of my list. I quilt every day, but this year I want to focus a bit more on new ideas. I hope to share some of my fantastic progress in the coming year. Woohoo! I hope your new year is full of adventure – quilting and otherwise! I started my Quilty 365 circles on November 8 so I finished up my 58th circle this morning. I must admit I thought I might have overindulged on my Internet sew-a-longs and that I would be calling this “Guilty 365” by now. But, I have surprised myself and in fact, it seems to be at the moment, the only thing I am keeping up with. I have decided the quilt will be 20 rows of 18 blocks each. Yes, you clever math people, that adds up to only 360, so I will have to applique a smaller circle onto the center of 5 blocks. Oh well, it adds to the excitement. I’ve also decided to piece the strips as I go so that all I will have to do next November is piece the 20 rows together and voila! a quilt is born. So, I have 3 rows pieced already (I feel so efficient!). I am winding them on to paper towel rolls as I piece them. It saves space and ironing in the end. I think I’ve been able to keep up because I prep a week’s worth on Sunday and that way I can put in some relaxing applique each morning before heading out for the day. Thanks again Audrey (QuiltyFolk) for giving me the nudge. Please check out everyone’s progress (here). Enjoy the day.